The body sits temptingly in the surface film held there by the parachute hackle. The additional sight ball gives the angler extra quality time on the water when the light begins to fade. This Hook requires some explaination. It is an adaption of a design evolved inth 1930s. Body : Dubbing is Fly Rite Fine Poly. Hackle : 5 to 7 turns of best quality hackle. Thread on to the post a plastic bead to act as a sighter. Secure the hook in the vice in the usual manner. Complete all body work and tie off. Remove thread and varnish head. When dry, secure the hook back into the vice by end of post. Re-attach thread to bottom of post next to body. 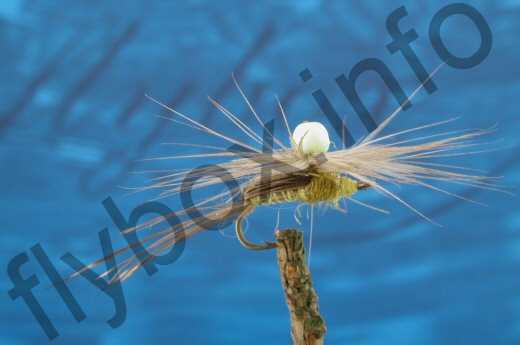 Make a few wraps along the post and tie in selected hackle and wrap around post towards body. Tie off against post, remove fly from vice and drop liberal amount of varnish where hackle circles post. When dry snip off surplus post. Currently there are no comments about the Parachute With Sight Ball fly pattern from other fly fishermen yet.